Within Rotary there are a number of recognition programs named in honor of Rotary's founder Paul P. Harris. 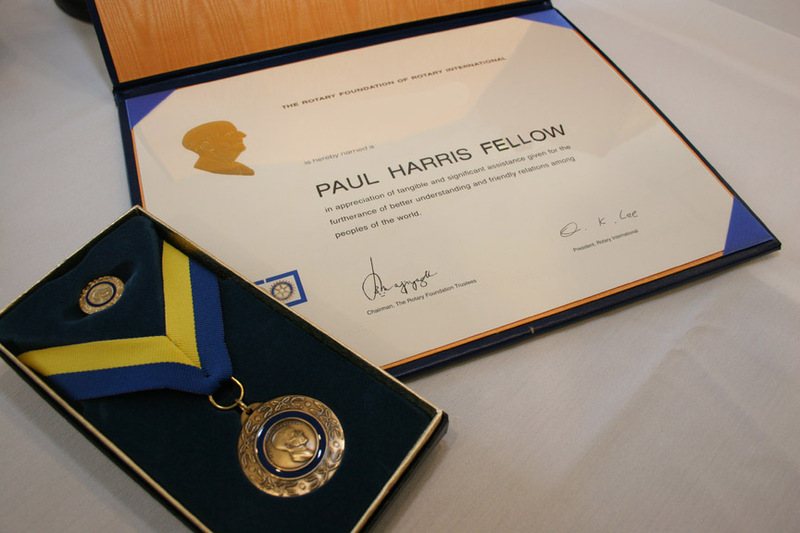 The most well known recognition is the Paul Harris Fellow. And within the Paul Harris honors are additional recognitions in the name of Rotary's founder. Besides the Paul Harris Fellow there is also membership withing the Paul Harris Society and a special honor is award to clubs who achieve a membership of 100% Paul Harris Fellows. This honor is bestowed on Rotarians and non-Rotarians. Anyone who contributes US$1,000 or more to the Annual Programs Fund, PolioPlus or an approved Foundation grant or has that amount contributed in their name may become a Paul Harris Fellow. Each new Paul Harris Fellow receives a commemorative certificate, a pin, and a medallion. Download and Submit: Recognition and Contribution form (PDF) with your check. This special Club Recognition is in honor and thanks for those clubs that provide $1,000 yearly of club funds, to either the Annual Fund, or Polio Plus. Billed each Rotary year by the District, these funds are submitted to The Rotary Foundation on Behalf of the club, to the fund of their choice, by our District Executive Administrator. A banner recognizing the giving of our Paul Harris Society Clubs, will be presented by District Leadership at a club meeting of your choosing. Paul Percy Harris (April 19, 1868–January 27, 1947) was a Chicago, Illinois, attorney best known for founding Rotary International in 1905, a service organization with more than one million members worldwide. However, prior to his founding of Rotary, Harris was a Jacksonville, Florida resident and worked for the granite stone company owned by George C. Clark, who later became the first president of the Rotary Club of Jacksonville in 1912. Harris and Clark remained close personal friends for rest of their lives. Harris was born in Racine, Wisconsin, but grew up in Vermont. He attended Princeton University, the University of Vermont, and the University of Iowa. For the next five years, he worked odd jobs for the newspaper, as a salesman, on fruit farms, as an actor, and on cattle ships that traveled to Europe. He began his law practice in 1896. Harris organized Rotary "in fellowship and friendship" with three clients, Silvester Schele, Gustavus Loehr, and Henry Ruggles. By the time of his death at the age of seventy-nine, the club had grown to more than 200,000 members in 75 countries. The club is dedicated to service above self. In his honor, individual Rotary clubs choose a Paul Harris Fellow who meets high professional and personal standards set by the founder. The fellow is honored at a fundraising dinner and receives a special certificate, a gold pin, and a gold medallion on a blue-and-gold ribbon. Copyright © 2019. Rotary Foundation 6970. All Rights Reserved.